Notice the Graphic: "As Time Runs Out"
If you missed it, on Thursday evening, Governor Palin appeared on Freedom Watch with Judge Andrew Napolitano on Fox Business. Many issues were discussed, but the chief thing to understand is that she basically ruled out an announcement within the next 24-48 hours to meet the “end of September” deadline some have inferred from her previous statements. 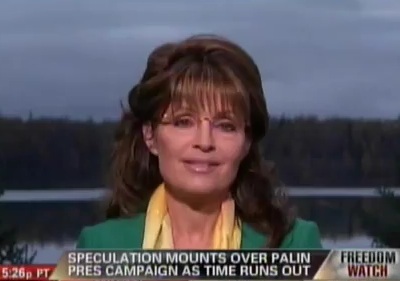 I know that Palin is a smart player, because she refuses to get locked into a date and time by the media. She flatly told Napolitano that she holds her cards close intentionally, knowing that the media is relentless in trying to nail her down as to some arbitrary announcement date they have concocted and pushed for their own purposes. This is a great move, because even now, the unrelenting circus of the childish “Draft Christie” movement continues, and looking at it objectively, it appears like a set-up. One can almost imagine that inside the Christie camp, there is a push by some to cause a spontaneous (read: astro-turf) movement to “convince” the New Jersey governor to run. What Sarah Palin is wisely doing by deferring the decision is to remain in control. Until she announces her intentions one way or the other, the race hasn’t begun in earnest. Some very interesting news developing this week offers to shake things up in Palin’s favor. Wednesday, it was revealed that the Florida primary may move up as to a date as early as January 31st. In response, Iowa, Nevada, New Hampshire, and South Carolina may be forced to move their primary up to as early as January 2nd. Florida is scheduled to announce its primary date on Friday. If they move their primary up, they will yield half of their delegates at the Republican convention, but many want to improve the state’s influence in choosing the eventual nominee, and being early rather than late tends to have that effect. This shifting of dates would have the effect of establishing clear front-runners early rather than late. This would play to the distinct advantage of candidates with greater existing name recognition, and this is where Palin’s strategy may pay off. While the other candidates have been busy trying to build name recognition in the electorate, in her absence, she’s still managed to influence much of the debate, and by now, we should have realized that she is the one candidate upon whom the rest are waiting. As I have argued many times before, it is this inescapable “Palin Factor” that haunts the steps of the other candidates. They are looking over their shoulders, wondering if or when Sarah Palin will enter, and while they do, they continue to play the established media game of the Republican Savior-of-the-Month. Are we on Savior number twenty yet? Shall we list them all again? At this point, if she holds off another week or two, it will make little difference for her campaign if she intends one. If the primary season leaps forward into January, it makes for an unconventional election process and primary season indeed. I think I’ve heard that before, somewhere. What this all means is that Governor Palin is very conscious of the calendar, probably more than most, and that she understands the gift of picking one’s time. Whether she enters, or decides to sit it out and be king-maker, the latter choice being the one I consider unlikely, she will be in a position to either win or have the most influential voice via a potential endorsement. None of the current crop of candidates seems particularly strong. While this could certainly change dramatically, it seems unlikely. There will be some jostling up and down, but the race seems to be stabilizing. Much in keeping with my assessment of the last debate’s results, Cain and Gingrich have each moved up, and Perry and Romney are gravitating toward one another in the middle twenties in polling. What this really demonstrates is that the field is altogether weak, at least for the moment. Republican voters still have their eyes open, and are listening intently for better options. Even at this increasingly late date, there’s still no definitive front-runner, but as time dwindles for others to enter, with the looming threat of an accelerated early-states calendar, it all plays into the hands of the candidate who can afford by virtue of name recognition to wait the longest to enter the fray. If Chris Christie or other establishment-favored candidates intend to enter, their windows of opportunity will close much more quickly than Palin’s. They may have the advantage of money-raising capacity in the short run given the nature of their friends, but they cannot beg, borrow or steal enough name recognition in such an accelerated schedule, whereas Palin does not suffer that impediment. There already exists an army of supporters ready to leap into the fray at a moment’s notice. She has the best name recognition among the lot of them, and that’s pure gold in an accelerated schedule like the one we may now be facing. Palin is smart to keep her cards close and play out her hand as she sees fit. While her supporters are still anxious for battle, most of them have now begun to see how this is playing out and have recognized the benefits of waiting a bit longer. They’re no longer worried over silly media narratives telling them when Palin “must be in” or when “it’s too late.” They’ve finally noticed that for all this talk by the punditry, on every show or interview in which she appears, Governor Palin is still being asked relentlessly to announce her intentions, and for her supporters, this has finally sunk in: The pundits had told us it was too late at least once in each of the last five months, and frankly, many more times than that, but if it’s too late, and Governor Palin is irrelevant, why do they still ask her with such insistent vigor? This stark and telling dose of reality ought to wash over anybody who has bought into that notion: If it’s allegedly so late, much too late according to some, why is it that they keep asking anyway? If Pundits A-D are credible, then why are Pundits E-G still asking? Yes, it’s clear that Palin’s supporters have figured out this part of the game, and they don’t seem so skittish as the first time or two the media ran with this narrative. They have moved on, and have begun to further their organizations rather than wait for the next day the media says this must be “the last, absolutely final chance” to get in. Again. The Hill | Did Obama Pressure Ford to Pull Anti-bailout Ad?